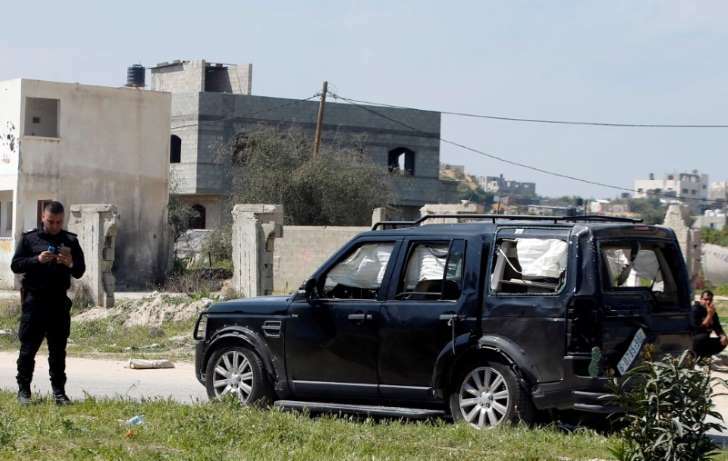 Gaza's ruling Hamas group blamed Palestinian Authority officials on Saturday for the attempted assassination in the enclave of Palestinian Prime Minister Rami Hamdallah on March 13. Finger-pointing over the roadside bomb attack on Hamdallah's convoy looks likely to deepen a bitter political rift between the Islamist Hamas group and Western-backed Palestinian President Mahmoud Abbas. Abbas blamed the attack on Hamas soon after the incident in Gaza, in which Hamdallah, who has spearheaded efforts by the Authority to reconcile with Hamas, was not injured. But Eyad al-Bozom, spokesman for the Hamas-run interior ministry in Gaza, told a news conference on Saturday that three senior officers of Abbas's West Bank-based Palestinian Authority had masterminded the blast. Reuters was unable to independently verify the allegations and the Authority rejected Hamas's accusation. Three men identified by Hamas as suspects involved in the bombing were killed in a shootout with its forces in Gaza on March 22. The Gaza Interior Ministry presented video confessions by four men it is holding in custody, who it said were part of that cell guided by the PA officers, who are based in the West Bank. It presented no further evidence. The assassination attempt has derailed efforts to end a deep divide between the two main Palestinian factions -- Hamas, which dominates Gaza, and Abbas's Fatah, the main force in the Palestinian Authority in the Israeli-occupied West Bank. Khalil al-Hayya, deputy head of Hamas in Gaza, told a separate news conference that the suspects "wanted to kill reconciliation". Al-Bozom said the suspected Palestinian Authority officers were also behind an attempt to kill Hamas's head of security Tawfeeq Abu Naeem in October in Gaza. A spokesman for the Authority's security services blamed Hamas for the March 13 blast. "The more Hamas tries to evade responsibility, the deeper it sinks," Adnan al-Dmairi told Reuters by telephone.